The newest edition of the Carnival of Homeschooling is up at http://smallworldathome.blogspot.com/2009/07/welcome-to-carnival-of-homeschooling.html. There are lots of great posts this week! Enjoy! On May 11, 2009, I posted the following interview with Jessica Hulcy of KONOS. Prayers for her continued recovery are appreciated by the family. There is also a fund that has been created to help the family with the medical costs. Recently, I received a copy of Jeannie Fulbright’s new Astronomy Notebooking Journal. We have long been fans of her elementary science books, and the addition of the notebooking journals makes them even more student friendly. Ms. Fulbright lists a lesson plan at the beginning of the notebooking journal that will correspond with the textbook for Exploring Creation with Astronomy. She tells you what pages to read in the textbook. She only gives notebooking assignments twice per week, so it is not an overwhelming amount of work. There are lesson plans for 28 weeks, so there is flexibility in using the books. Or you can do lessons more than twice a week and cover more than one book per year. The Botany Notebooking Journal is also ready, and I have heard that she is working on the notebooking journals for her other books. But let me tell you more about the Astronomy Notebooking Journal. It is spiral bound for easy student use. And the pages are designed with plenty of room for the student to write and personalize. There are also review questions for each lesson. I particularly like the cross-word puzzles and mini-books at the end of the journal. I have 5 boys, and they do not particularly enjoy lapbooking, but this notebooking journal is something they can use without too much prodding from their teacher. We have found that lapbooking involves too much cutting and writing for little boys. So I am happy to have something that will give us a few mini-books and journal pages without being overwhelming. These notebooking journals are written for children ages kindergarten through grade 6. I would give Ms. Fulbright 5 stars for these notebooking journals, and that says a lot coming from me. I have tried a lot of materials over the years. This was a very easy decision in adding to my website. Tax-free week-end in North Carolina is August 7, 8, and 9. This is for educational supplies and books, and more! Discount Home School Supplies will be set for tax free for NC residents, so mark your calendars and make your lists now!!! This is also the week-end for the Love to Learn Conference in Charlotte. Your purchases at the convention will be tax free!!!! You will need to enter your zip code to get the dates for your area. The breakfast is usually on the Saturday of the event. Call your store to verify the date and time for the breakfast. It is worth the trip! I received a card in the mail today from Office Max. It was an invitation to their Teacher Appreciation Day. In the store in Hickory, NC, it will be on Sunday, August 9, 2009. It does not list a time, so I am assuming it starts when they open that day. I found information online on their website after doing some digging. If you go to www.officemax.com/penny, you will see information at the bottom for Teacher Appreciation Day. Here is the link to the page that they take you to from the previous link http://www.officemax.com/home/custom.jsp?id=m3610272. This date is actually better for me than a Saturday, since I will be at Love to Learn on August 8th. 7/28/2009 – Comments are now closed! Thank you for participating! The winner is Melissa. I have sent an email to you through Facebook. CONGRATULATIONS!!! It’s time for my annual microscope giveaway in honor of my anniversary with Discount Home School Supplies. It has been 4 years since I started the journey in selling homeschool books. The contest is open to residents of the United States only. I am sorry that I cannot offer this internationally at this time. The contest will end at midnight on Monday, July 27, 2009. I am not going to be picky with EST standard time versus Pacific Time. I will be in bed asleep that night when the contest ends. I will get up on Tuesday, July 28, 2009, and tally the entries from the sources of entry. Then I will have a random drawing. I would greatly appreciate it if you would tell your friends and send them to this blog. I am not making it mandatory for you to enter the contest. But the more people who know about it, the more people who will learn about my website. You can also receive FREE shipping on any order that is $25.00 or more. This is a limited time offer for FREE shipping. Visit my website Discount Homeschool Supplies to take advantage of this deal! This is a great time of year to order homeschool materials. When August rolls around, I see more backorders from publishers. The earlier you order, the better chances you have of getting your items quickly. The World of the Microscope Book! Introducing the newest member of the My First Lab series! Two light sources allow this microscope to magnify both slides and solid objects! View slides, coins, plants, stamps, insects, jewelry, and more!You would need two instruments to view what this one does–a basic biological scope to look at specimens on a slide (light shines up from under the slide and through the tissue) and a traditional stereo or dissecting microscope to view solid objects at lower power (light shines down onto the specimen to be observed). This new Duo Scope with dual lighting allows for both types of applications! Cordless battery power makes it portable for field study. Priced to fit any budget with the same fine quality as our other scopes. Welcome to the 185th edition of the Carnival of Homeschooling. If you are new to the Carnival, WELCOME! This Carnival was started by the Cates family of Why Homeschool, and they have done a magnificient job with the administrative parts of keeping this Carnival going week after week. It truly is a labor of love. And it is such a fun way to catch up with favorite bloggers and meet new bloggers. July is the time of year when most homeschool families are enjoying the freedom of learning while living. I know in our home, July is a time of year when we are enjoying some much-needed down time from a hectic schedule that always seems to be the norm during the regular school year. I am always amazed at how much children learn while playing, and that is a commodity that is short in the lives of many children. July is also a time when I start looking at our school needs for the coming school year. I review through what we accomplished in the past year, and I see where each of my children needs to focus more in the coming year. I have cleaned out my school cabinet and put away those things we are finished with, and I celebrate the accomplishments that each child made in the previous year. So let’s see what else is going on in the world of our homeschooling blogging friends…………. Mrs. M of Rooster Hill shares some wonderful information about planning rescources for homeschoolers. Lara DeHaven presents It?s a Jungle Out There! posted at Texas Homesteader. Nancy Miller presents Cutting the Costs of Post Secondary Education Online posted at Online Christian Colleges. Leslie tells us that there are new exciting additions to our home school this year. The Robinson Curriculum (self-teaching program) and Classical Conversations (a leader in training parents to educate their children with tools to learn and master any subject)! Ruby of Freehold2 talks about the phenomenon known as summer learning loss, or “summer slide.” Research has shown that the average student will lose about 1 month of his previous year’s overall learning by September – and in math skills this figure is a whopping 2.6 months!Although there seems to be no specific research on whether homeschoolers experience summer slide, logic dictates they could if schooling stops over an extended period of time. This post looks at some of the factors that contribute to learning loss and at simple, inexpensive ways that parents (homeschooling or not) can combat it. Susan Gaissert presents The Magic Number posted at The Expanding Life. Jennifer of Homeschooling Memoirs shares with us a brief unit study that she wrote for her children on Chocolate Fever. Carol Topp, CPA presents Getting an EIN (Employer Identification Number) posted at HomeschoolCPA’s Blog. Alvina Lopez presents 100 Best Blogs for Christian Homeschoolers posted at Online Bible College Degrees – Online Bible Colleges. ChristineMM presents My Older Son is Blogging Now posted at The Thinking Mother. Misty presents Potted Plants – Fun and Responsibility for Kids – Tuesday Tips posted at Homeschool Bytes. Kiwi Polemicist presents Sweden wants to outlaw homeschooling done for religious and philosophical reasons posted at Kiwi Polemicist. Karen of New Every Morning tells us before she begins to make her fall homeschool plans, she wants to give thanks to God for the many blessings in her life and ask Him to bless their homeschool year, and she shares her list of some of the many things that she is thankful for. Sarah presents Doing a Good Job: No One Asked Me posted at SmallWorld. ~Kris~ presents Planning Tips posted at Weird, Unsocialized Homeschoolers. Beverly’s Homeschooling Blog shares with us that there are different types of homeschools - different philosophies, beliefs or practices. I’m more from the traditional homeschooling stance, although I see the benefit the other options can offer. The question is, are these other programs diluting the purity of homeschooling as we’ve known it? Does it put our homeschooling freedoms at risk? What’s your opinion? Should these alternative methods be considered homeschooling? Michelle of Homeschooling and Homesteading in the Present tells us about their excitement with studying the Revolutionary War. Andrea presents Schools interfere with education posted at Atlanta Education Homeschool Blog. MiaZagora’s Homeschool Minutes introduces the web site “The World Carrot Museum.” It’s about what I call “accidental” learning, in that it was a spur-of-the-moment thing that turned into a long web investigation of the carrot. Today, we are going to go to a place where I know there are a lot of Queen Anne’s Lace flowers and pull some up by the roots, look at them and press some – but probably not eat them! What does Queen Anne’s Lace have to do with carrots? Check out the post and World Carrot Museum to find out! Lynn presents Back to School Plans with Resources Attached posted at Eclectic Education – Homeschool Blogger. Henry and Janine’s (Why Homeschool) oldest daughter writes a little about homeschooling. NerdMom presents Charter Schooling: A Better Homeschool? posted at Nerd Family. Thus ends the 185th edition of the Carnival of Homeschooling. Thank you for joining us this week. 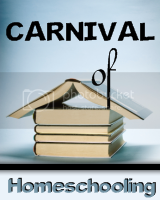 Next week the Carnival will be hosted by HomeschoolCPA’s Blog. Please tell your homeschool friends about the Carnival of Homeschooling. A special THANK YOU to the Cate Family of Why Homeschool for keeping the Carnival of Homeschooling running from week to week! Anniversary Sale starts next week! Next week will start my annual anniversary sale on my website. I will be offering free shipping on all domestic orders over $25.00. So it will be a great time for you to order your books for the new school year. I will also be giving away a microscope. I have given away a microscope (MFL-06 Duo Scope) every year during my anniversary sale week, and it is a lot of fun for me to bless another family with something that they may not be able to add to their school otherwise. This will be the last week of my Saxon Math sale. With the prices I am offering, my Saxon stock has gone down quickly. As I sell out of a particular item, I am changing the price back to my normal discounted price. The prices are so good that I cannot offer free shipping on them next week, so all of the Saxon prices will be back to their usual discounted prices on Sunday, July 19. You can find my Saxon sale page on my website at http://www.dhss.com/shop/custom.aspx?recid=9. I also have an increible offer from a publisher friend of mine, Laurie Latour. She is giving away electronic copies of her Future Christian Homemakers Book. I have the print version in my personal library, and my daughter and I both love it. Remember, you can also find me on Ebay at http://stores.ebay.com/Discount-Home-School-Supplies_W0QQssPageNameZl2QQtZkm. You are welcome to visit my website to continue browsing. I hope and pray that you were blessed and encouraged by this month’s newsletter. I am also on Facebook now! You can search for “Discount Home School Supplies” and become of fan! I am hosting the next Carnival of Homeschooling here! I am excited to be hosting the Carnival of Homeschooling next week on my blog. I always enjoy receiving the entries and reading them as I put the carnival together. I do not have a specific theme in mind other than articles that deal with home education. There are so many varied ways to homeschool and instill a life-long passion for learning in our children. Let’s have a great time and share some of our passion for educating our children at home! It will be greatly appreciated if the submissions come in earlier. I work on assembling posts as I have time during the week leading up to the Carnival. You can also send in a submission via Blog Carnival by going here. If you haven’t read any blog carnivals before, please read What is a Blog Carnival. Thanks so much! I am looking forward to reading your articles! !